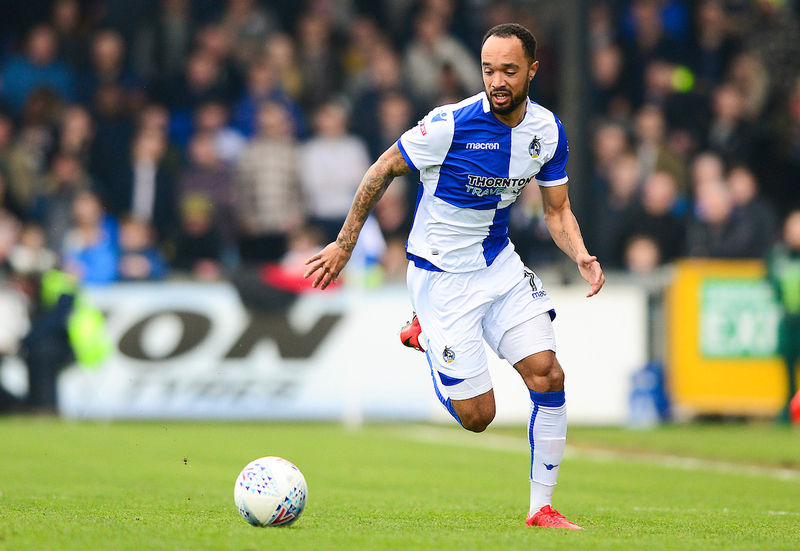 Rovers shared the points in an entertaining encounter at the Mem against play-off chasing Charlton Athletic, as Kyle Bennett’s first-half goal was cancelled out on the stroke of halftime by a deflected effort from Ben Reeves. Manager Darrell Clarke included three changes when naming his side for the visit of Charlton. Into the line-up came James Clarke, Bernard Mensah and Liam Sercombe, as Joe Partington, Chris Lines and Dom Telford all missed out. Liam Sercombe returned from the injury that forced him to miss the two Easter fixtures, while James Clarke was chosen as a like-for-like replacement for the injured Joe Partington. In opening exchanges, Rovers settled into the game the quickest of the two sides, as Lee Brown sent an early cross to the far-post that swept away from the advancing Rovers contingent inside the penalty area. Kyle Bennett was able to recycle the delivery and force a corner, that saw the forward work the set-piece to Lee Brown outside the area, but the defender’s powerfully struck shot was deflected away from the target. Charlton did create early threats on goal, as Sullay Kaikai managed to break into the Rovers area from wide out left. Kaikai was tracked by Tom Lockyer, as the defender narrowed the angle of goal which resulted in a low-shot towards the near post that Sam Slocombe was equal to. Lee Brown was enjoying space down the left to advance into the final third during the first-half and again produced another well-weighed cross to the far-post that had to be headed out the path of Bernard Mensah, who was poised to attack the ball. 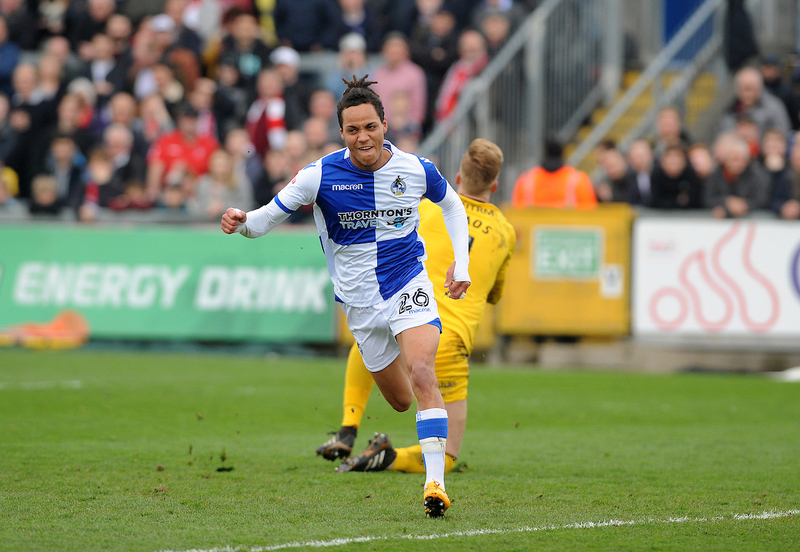 The ten-minute mark saw Rovers come close to scoring the opening goal, as a flowing move through midfield saw Ellis Harrison running with purpose into the final third before sending a driven attempt on goal that kept low and was tipped onto the post by Ben Amos, while Lee Brown’s cross from the rebound was deflected behind for a corner. The home side continued to look a threat on the break and edged ahead in the contest midway through the first-half. A routine back header towards his own goal by Jason Pearce lacked the power required to reach Ben Amos, as Kyle Bennett profited by latching onto the mistake and poking home a finish past Amos for his third goal for Rovers. In the aftermath of the goal, Liam Sercombe was substituted, as Tom Broadbent was introduced, with skipper Tom Lockyer switched to the centre of midfield in a slight reshuffle. There were moments of concern for the Rovers defence, as Nicky Ajose managed to dig out a curling attempt on goal that required an acrobatic save from Sam Slocombe, who produced a superb stop to tip the ball over the target. In the minutes leading up to the break, as Bernard Mensah cross fell to Kyle Bennett on the outskirts of the area, as the midfielder was able to set his feet and launch a well-struck effort on goal that reached Amos at a comfortable height to save. Stoppage time in the first-half saw the visitors restore balance to the scoreline, as Ben Reeves managed to steer a shot towards the target from the edge of the area, as Reeve’s attempt took an unfortunate deflection off Lee Brown that took the ball out of reach of the diving Sam Slocombe. Rovers came out following the break on the front foot, as the game quickened in tempo. A break from deep from Kyle Bennett opened up the Charlton defence, as the winger waited patiently to lay off a pass to Ellis Harrison. The striker advanced towards goal but blasted his right-footed attempt past the upright. Harrison’s attempt was quickly followed by a chance at the other end for the visitors, as Ben Reeves again took sight on goal from outside the area, as a measured side-footed attempt from the midfielder was pushed around the post by a fine diving stop from Slocombe, who benefited from an unhindered view of the shot. Rovers had a strong appeal for a penalty turned away as the clock passed the hour mark, as a Lee Brown cross pinballed around the area and looked like it may have struck an arm of the covering Charlton defender, with the referee quick to dismantle the calls for a spot-kick. As the time dwindled away, a quick-thinking pass from Rory Gaffney allowed Kyle Bennett to break at pace. The winger drew in a number of players before slotting a pass through to Ellis Harrison. The striker was set against ‘keeper Ben Amos in a foot-race to get to the pass first, as the goalkeeper raced well off his line to clear the ball for a throw-in. The final change for Rovers saw Darrell Clarke replace James Clarke with Development Squad defender, Michael Kelly, for his full EFL debut, as the left-back was immediately involved in the action, firing a number of crosses into the Charlton area. Inside the final ten minutes, there a nervous moment for Rovers as an inswinging corner from the right caused a series of problems. Both Joe Aribo and Josh Pearce almost bundled home close-range attempts with the ball bouncing around the six-yard area, as a staunch Rovers presence on the line deflected the multiple attempts clear. Rovers XI: Sam Slocombe (GK), James Clarke (77′ Michael Kelly), Tom Lockyer (c), Tony Craig, Lee Brown, Ollie Clarke, Liam Sercombe (23′ Tom Broadbent), Byron Moore, Bernard Mensah (50′ Rory Gaffney), Kyle Bennett, Ellis Harrison. Unused Subs: Adam Smith, (GK), Ryan Sweeney, Luke Russe, Dom Telford. Charlton XI: Ben Amos (GK), Nicky Ajose (Stepheny Mavididi), Joe Aribo, Patrick Bauer, Anfernee Dijksteel, Jake Forster-Caskey, Sullay Kaikai (90+1′ Josh Magennis), Lewis Page, Jason Pearce (c), Ben Reeves, Michael Zyro. Unused Subs: Dillon Phillips (GK), Johnnie Jackson, Mark Marshall, Ezri Konsa, Naby Saar.